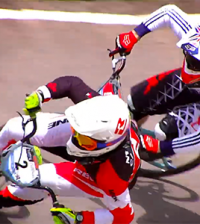 BMX (Bicycle Motocross) will make only its second appearance at the Olympic Games, following its debut in Beijing. It’s a fast, daredevil event with riders needing strength, power, flexibility and nerves of steel to succeed. Wheelie: Lifting the front wheel off the ground, or riding on the rear wheel only, usually with some combination of pulling on the handlebars, pedaling harder and balance. Doubles or whoops: The bump or undulations in the track. Doubles is two in a row. Manual: To ride on the rear wheel without pedalling, typically over the top section of jumps. Bunny hop: To lift both wheels off the ground by crouching down and then exploding upward, pulling the bike with you. Shanaze Reade (pictured) – the GB rider from Crewe will be looking to put the disappointment of Beijing behind her as she goes for gold in London. 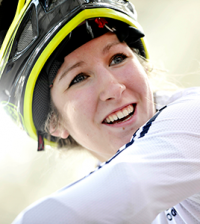 At the last Olympics, aged just 19, she went in as the world champion and favourite to win. But when she found herself in second place in the final approaching the last bend she went for a last ditch attempt at gold and found herself crashing to the ground, and coming home without a medal. Look out out for reigning world champion Magalie Pottier and number one UCI ranked rider Caroline Buchanan of Australia, who is also the time trial world champion. Following the recent world championships which saw both Shanaze Reade and Caroline Buchanan crash, it’s got to be Magalie Pottier. After the Games the BMX track will be open to the public as part of the Velopark in the Olympic Park.